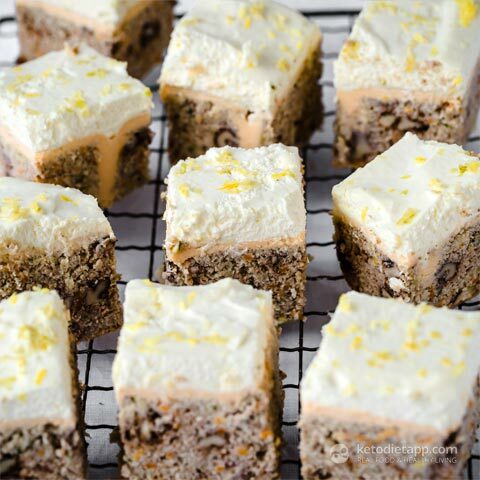 Two of my favourite things combined in one recipe… slow cooking and cake! 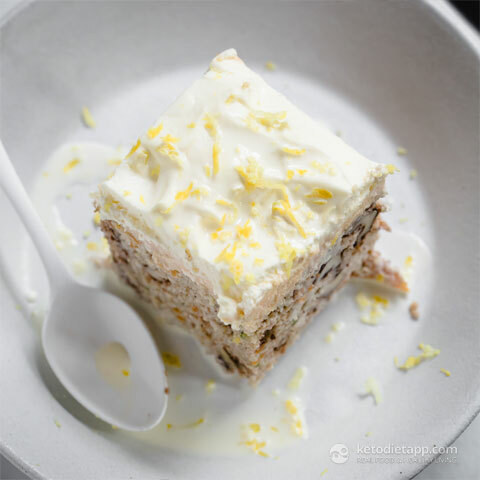 This low-carb carrot and zucchini cake has all the wonderful flavours of your favourite carrot cake but made keto friendly. 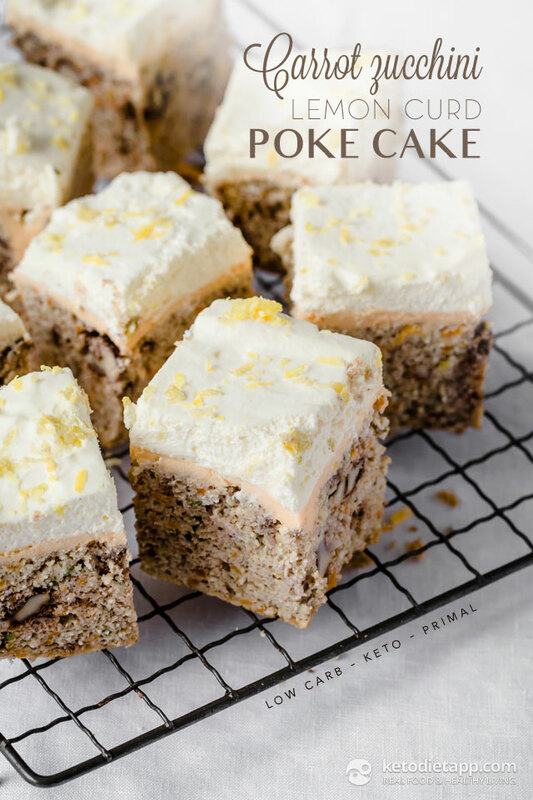 If you’ve not made a poke cake before, they’re wonderful. By poking holes in the base, the lemon custard filling layer oozes down into the base so all the flavours mix through. It’s delicious. 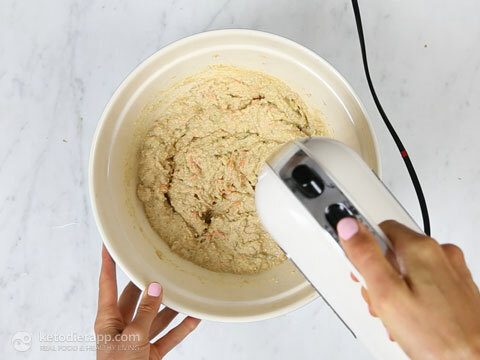 Cooking this keto carrot and zucchini cake in the slow cooker makes the base lovely and moist and means you can nip out to do any jobs you need to do and leave it cooking away. When you return the whole house will be filled with the welcoming scent of cake! Making a poke cake takes a bit more time as you need to let all the layers cool but it’s totally worth it. This low-carb cake can also be frozen for up to 3 months, just let it naturally defrost before eating. I hope you enjoy it! 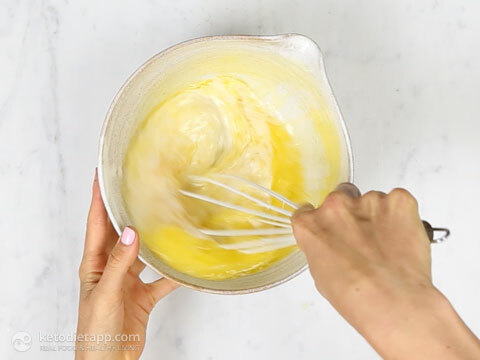 In a bowl, using a hand whisk, mix the wet ingredients for the cake base: eggs, lukewarm almond milk, melted butter and apple cider vinegar. 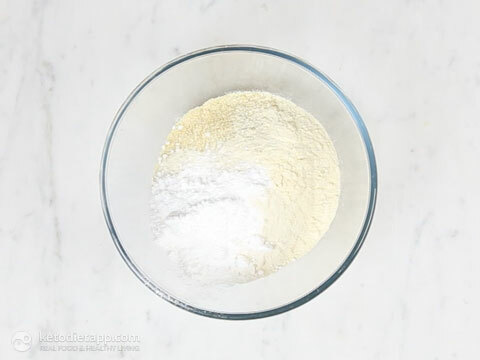 Place all the dry ingredients for the cake in a bowl: almond flour, coconut flour, whey protein powder, powdered Erythritol. 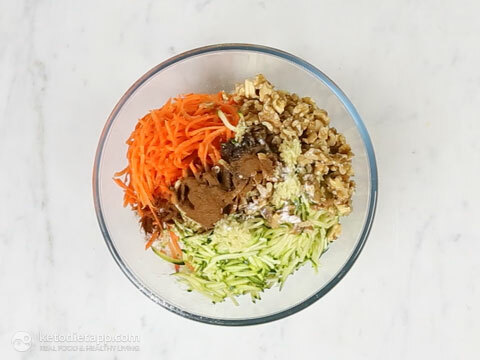 Add the carrots, zucchini, walnuts, ginger, vanilla powder, baking soda, salt and cinnamon. 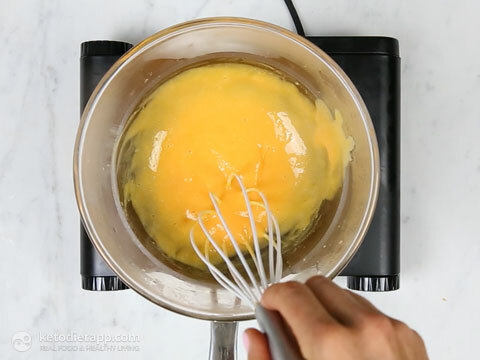 Pour the egg mixture into the bowl and process until smooth using an electric whisk. 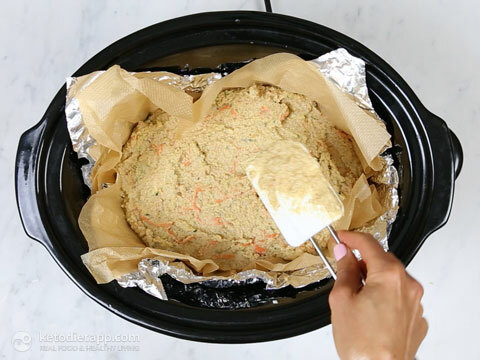 Pour the batter into the lined slow cooker and cover with a lid. Cook on low for 3 – 3 1/2 hours (until the top is set). When done, remove the lid and let the cake cool down until it reaches room temperature. 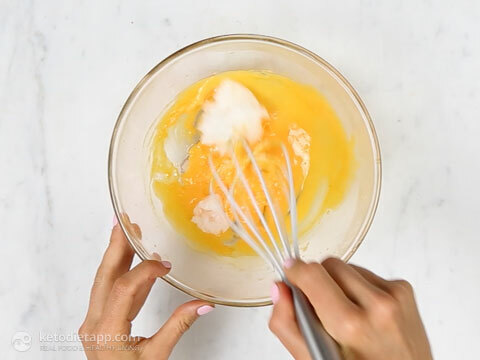 Mix the yolks with the lemon juice and add lemon zest. Place the bowl over a pan filled with simmering water and stir continually, make sure the water doesn’t touch the bottom of the bowl. Continue stirring for 5 – 10 minutes or until the custard starts to thicken. Remove from the heat. Add the butter or coconut oil and mix until dissolved. 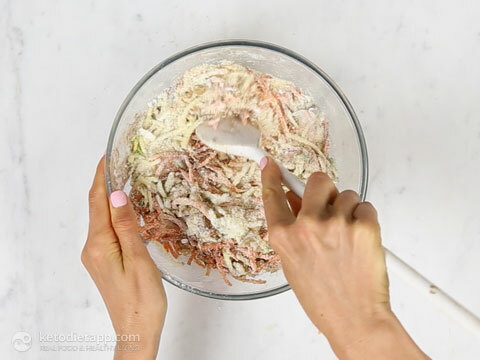 Add homemade keto condensed milk and mix until combined. 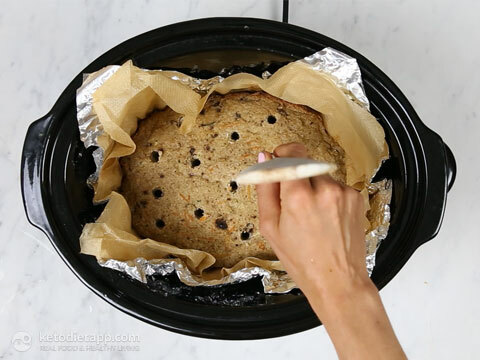 Using the handle of a wooden spoon, poke several holes all over the cake base. 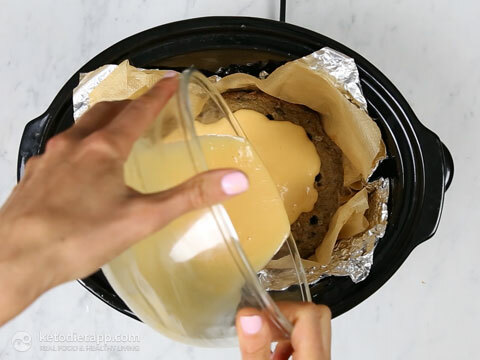 Pour the custard evenly over the cake base until covered and the holes are filled. Set aside. I left in a cool place for 2 hours to help the custard cool down and set. Meanwhile, prepare the cream topping. Whip the cream or coconut milk (add powdered Erythritol if preferred) until stiff peaks form. Spread over the cooled cake. Finish with an even sprinkle of lemon zest. 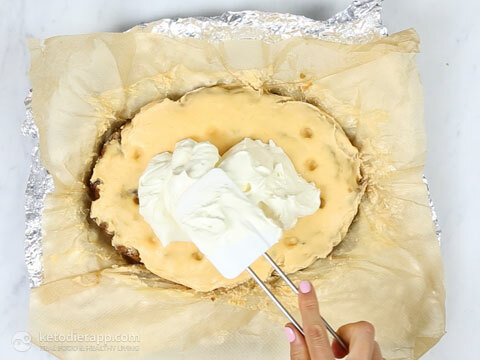 Grab the parchment paper with both hands and transfer the cake into the fridge to chill until set. 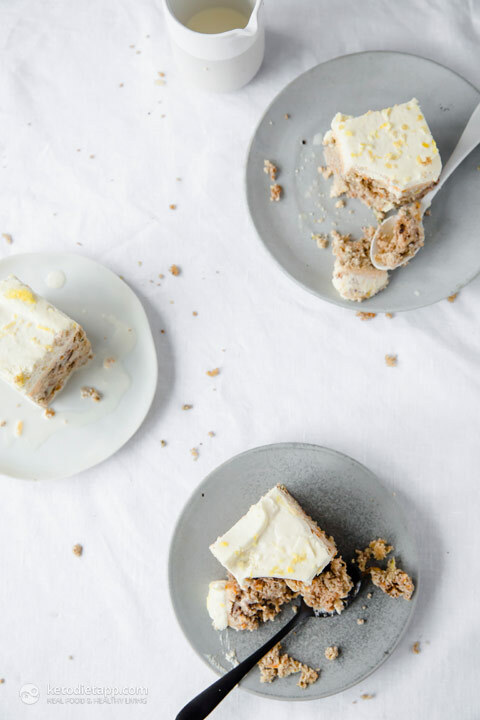 Once chilled and set, slice into 13 pieces (just like on the picture in this Keto Tiramisu Poke Cake recipe. Optionally, enjoy with a drizzle of heavy whipping cream. Store in the fridge for up to 5 days or freezer for 3 months. Looks so delicious! I love the soft texture - this cake looks perfect for the season. 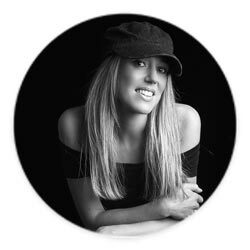 Hi Tammi, if I was to guess I'd say you need about 70% of the dough for similar results. For simplicity I would personally halve the cake base recipe and the topping (going by grams/oz and ml/fl oz), otherwise the cake would be too tall. 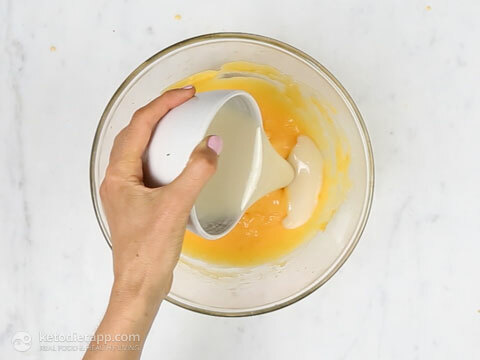 As for the custard it's hard to divide an egg yolk so I would use 2 egg yolks, 60 ml lemon juice, 2 tsp fresh lemon zest, 3 tbsp butter and 2/3 cup homemade Keto Condensed Milk. You'll have more custard but I always think that's better than not having enough. I hope this helps! You list egg white protein powder as a substitute for whey protein powder. I keep dried egg white powder (no additives) in my home because I'm pretty bad at separating yolks from whites. Is that the same as egg white protein powder? 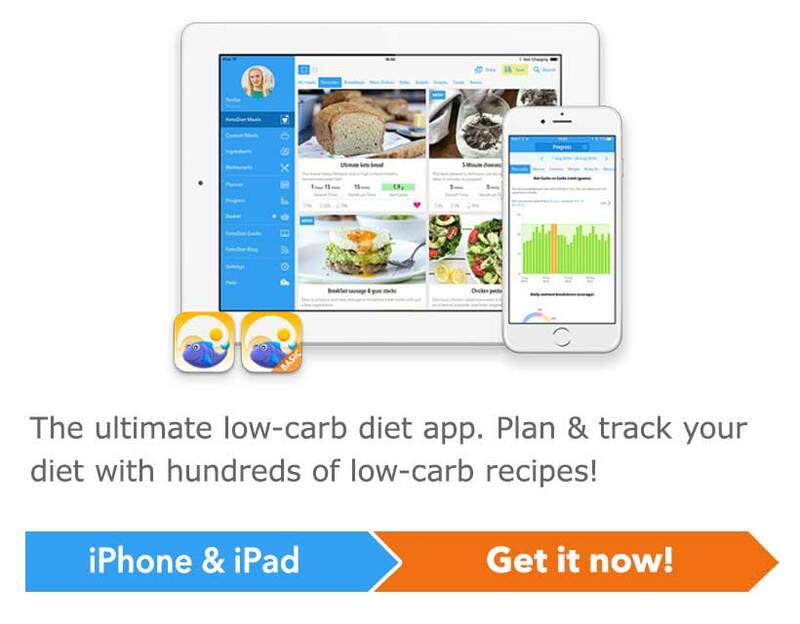 And if you don’t have a slow cooker . . . . ? Can it be cooked in an oven? It sounds so delicious, I would love to try it! Thanks for that - will check it out!